We shared this perfect plate of oysters on the island of Mersea this past summer in England. It was served to us in a small seafood restaurant right on the shore with a splendid view of the nearby boatyard and the English Channel’s tide. We had found ourselves there by pure chance. I had never heard of Mersea Island up to two days prior to our trip there. It is a small piece of land separated from Essex by a strood which floods twice a day cutting the island from the rest of England for half an hour at a time. So, we piled in our little red car and headed there from St. Albans. 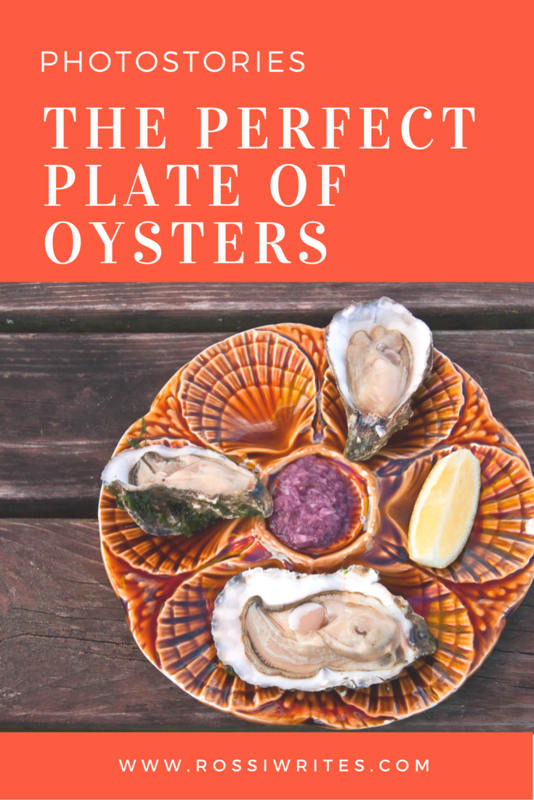 Once we had our fill of pebbly beaches and dreamy beach huts, a kind local guided us to the Mersea Island Fish Bar where we took an outside table and treated ourselves to oysters and a seafood platter. We knew we were at the right place when we were told that the oysters of Mersea Island are so famous that the King of Belgium receives a box once a week. Their fame is based in history, too as Queen Elizabeth I also treated herself to the oysters of Mersea. I have been meaning to tell you about Mersea Island in minute detail and glorious photos for some time now and I promise I will do it very soon. For the moment let’s just focus on this picture here and let me tell you a bit more about the local oysters. All learned thanks to a large poster inside the fish bar, making for a fascinating reading. So, did you know that a rock oyster produces around 100 million babies a year? Or that an oyster is bisexual – female one year and then male the next? Oysters are also full of zinc, which boosts blood flow and makes your libido rocket. Oysters haven’t changed for around 200 million years! Well, why tinker with a good thing!? Plus an oyster has two beating hearts (so glad I read that after having had my oyster, the thought of eating it raw is just about what I can stomach). And finally, oysters have been cultivated in the creeks around Mersea Island since Roman times. I have to say that even though I come from a sea town, I hadn’t had oysters until I moved to England and then it took me some time to actually come across them there, too. My first taste of oysters was in gorgeous Whitstable where there is a small restaurant dating back to 1856. I didn’t dare have them raw the first time, so we ordered half a dozen battered oysters with chorizo (I know it sounds wacky, but it tasted really good). Anyway, the lady behind the fresh seafood counter there convinced us to try one raw each. The secret is to tip your head back, then slide the oyster quickly from the shell into your mouth and straight down your throat. It is wet, salty and slippery and it feels like you have taken a sip of the pure essence of the sea. Since then I have had oysters a couple of times and I always stop at one. It feels like a small luxury, something special to start a nice meal with. The oysters we had on Mersea Island were exquisite. Their taste was beautifully complemented by the chopped onions with vinegar they were served with. A nice touch I hadn’t seen added anywhere else. Sitting there enjoying the oysters, the seafood platter and some chunky chips under the warm afternoon sun whilst watching the boats on the blue waters of the English Channel is an image deeply engraved in my memory. If you want to see more pictures from Mersea Island and its gorgeous beach huts, click here. I promise to soon post more photos and text about this lovely and tranquil place. Have a great day! Have you tried oysters before? Do you like seafood? I know it is such a divider in terms of food preferences. Some people can’t eat it no matter what and others simply can’t get enough. Which one are you? Share with me your thoughts in the ‘Comments’ section below. I would love to read them and engage with you. For more stories like this, please, follow me on Facebook and subscribe to my newsletter. Thank you!